For several years the fight over which exercise is better for legs has been doing the rounds and unfortunately none of them has managed to found a clear winner. Even though both the exercises are know for their many benefits in improving leg strength, there has always been a debate over which is the best exercise for legs. The ongoing Squats Vs Leg Press battle often make people overlook the overall benefits of both the exercises. As a general phenomenon, both squats and leg presses can never be interchangeable or even remotely equal to each other as they both have their share of pros and cons when it comes to exercising and body building. For most of the people, it all depends upon their individual goals and what they expect from every exercise they are performing. If someone is looking for complete body workout then squat is a better option as it works on considerably more muscle groups and also aids in developing coordination. On the other hand, leg press works the legs in isolation, which makes them an ultimate leg workout, thus leaving no space for other extraneous factors like improving balancing. It focuses solely on pushing leg muscles harder, which certainly is not the only focus area in squats. Different variations of squat exercise works more effectively on quadriceps muscles, hamstrings and calf muscles as compared to the variations of leg presses. However, their benefits are not limited to leg workouts only and promotes body-wide muscle building. 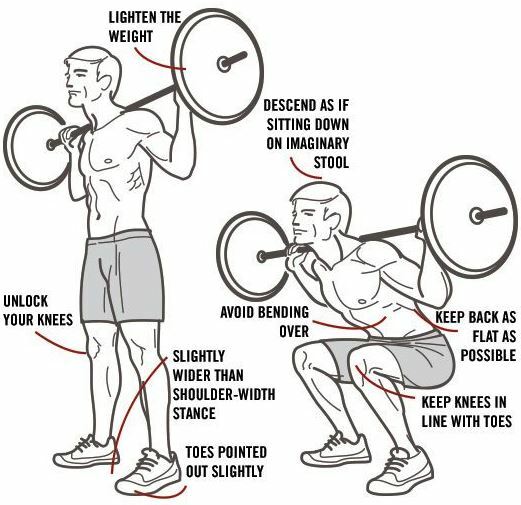 Intense squats training, if done properly, triggers the release of testosterone hormones in the body, which are considered essential for improving muscle mass in your body. Squat is considered to be one of the best functional exercises that help your body in performing real life activities efficiently. When you start performing squats, your body builds muscles and help them in working more efficiently, while promoting mobility and balancing as well. Squats have always been touted to be phenomenal in increasing the leg strength. They work excellently on your core, stabilises muscles, help maintain balance and improve communication between your brain and your muscle groups. Most of the athletic injuries are caused because of lack of stabilisation in muscles, ligaments and connective tissues. Squats strengthens all these areas by improving your flexibility and balance, thus reducing the chances of athletic injury. Squat is an excellent multi-purpose leg training exercise that works not only for strengthening your legs but also tones and tightens your abs and back. Squats helps in building muscles, which further regulate glucose levels, lipid metabolism and insulin sensitivity in your body, thus protecting you against diabetes, cardiovascular diseases and obesity. 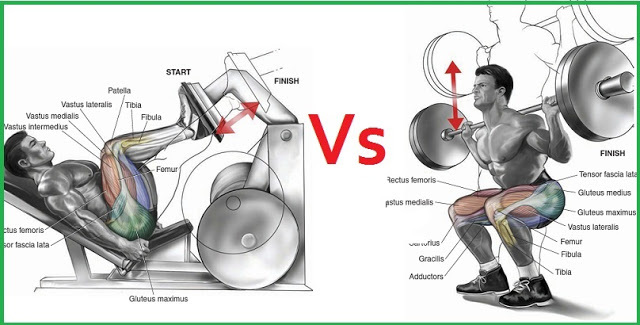 All these points might shout hard that squats are any day better as they provide total body strength, hypertrophy and quad hypertrophy, still its too early to declare squats a clear winner without analysing the advantages of leg press. Related article: 5 Training Tweaks To Get More Quads Growth On Leg Day! If your major exercising goal is to add bulk to your legs then leg press is one of the best leg exercises that focuses solely on major leg muscles. Because this exercise is performed on a machine and you don’t need to focus on your stabilising muscles while performing this, thus allowing you to add more weight to your exercise for gaining more muscle in your legs. Leg press exercise do not put any direct pressure on your spinal column and its a good thing for you if you are suffering from any kind of back problems. Because leg press is performed in a different torso angle, your vertebrae doesn’t have to bear any kind of load directly. Not all are blessed with the flexibility to perform squats conveniently and unless you are into serious body building and power lifting you don’t need to perform squats for strengthening your legs. For people with health issues like poor structure, back problems, lack of hip flexibility, etc. leg press is a sufficient workout to strengthen their legs without getting into intense squat session. Difference between Squats & Leg Press is quite apparent and there is no reason for anyone to hate one or love another completely. Even though squat is looking superior to leg press because of its complete body functionality and ability to improve your overall sports performance, leg press still remains a considerable option for people suffering from back problems. Free weights are any given day superior over machine exercises, still they allow your body to do things which you cannot do with free weights. Thus, it will be good to incorporate both in your training schedule, though avoid using them both at the same time as it will lead to over training of your muscles. Instead of championing over any one Leg building workout, find a way to perform both for your leg strength as well as full body training. A little variety in your training will definitely not do any harm to your schedule and body.